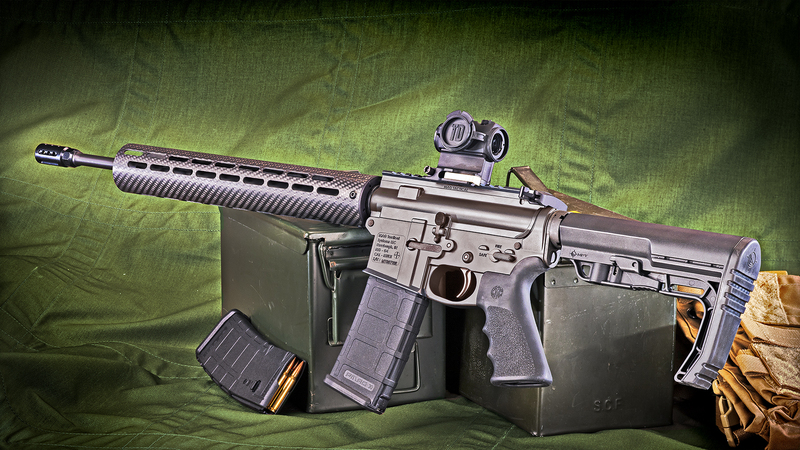 October 17, 2014 By Denny Hansen & filed under All Articles, Rifles & Carbines, Weapons. Many years back, I saved my uniform allowance for my first AR-15. It was a Colt SP-1, and I marveled at how light and short it was. The last three digits of the serial number were 007, and I jokingly referred to it as my “secret agent” rifle. I later bought an SP-1 carbine with 16-inch barrel and collapsible stock and, by comparison, the rifle seemed as long as a fence post. As time passed, although I still appreciated the short length, the weight increased dramatically with the addition of weaponlights, optics and lasers. Over time, I began to save weight on the carbine wherever possible. For example, my current “go-to” weaponlight is a SureFire M600 Ultra Scout Light, which puts out 500 lumens of white light and weighs only 5.6 ounces. Mag Tactical Systems (MTS) has taken light weight to a whole new level. I recently acquired one of their I.C.E. 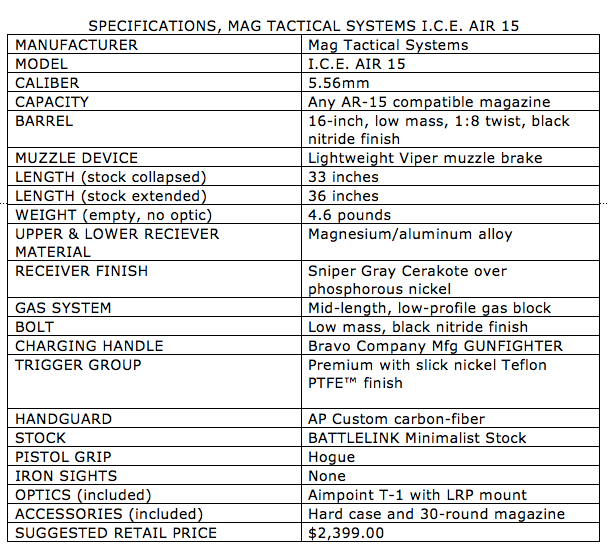 AIR 15 carbines for evaluation. The AIR 15 is a collaboration between Rob Pincus of I.C.E. Training and MTS. The carbine is similar to other MTS models but incorporates a few differences according to Rob’s specifications. Without a doubt, what sets this carbine apart is its light weight: it tips the scales at a mere 4.6 pounds empty. Several things account for this light weight, starting with the upper and lower receivers, which are made from a magnesium/aluminum alloy that is 35% lighter than aluminum alone. The receivers are finished in Sniper Gray Cerakote™ over phosphorous nickel for an extremely durable finish. The trigger guard is an integral, non-removable part. But it is oversized and will accommodate a gloved finger. A Hogue pistol grip is used. The bolt is what MTS refers to as low mass, and material not needed for the function of the carbine has been removed. 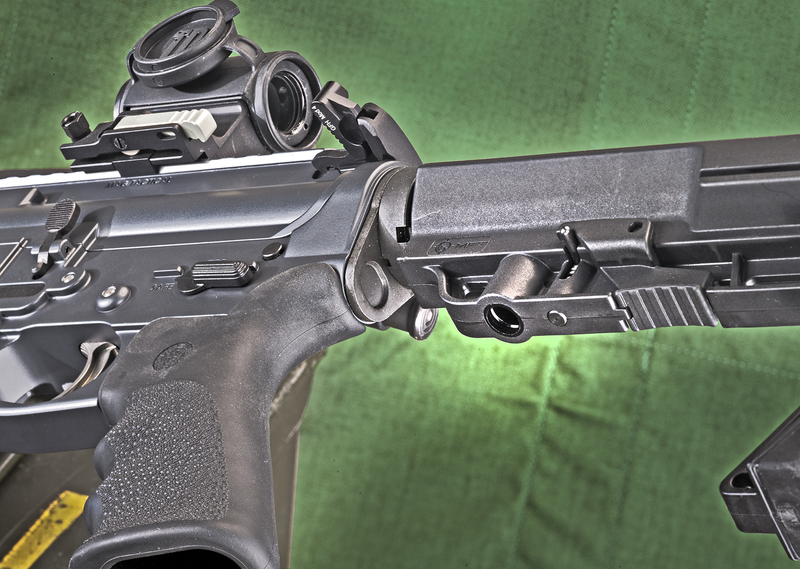 The bolt is operated with the superb Bravo Company Mfg GUNFIGHTER (Mod 4) charging handle. The 16-inch barrel has a 1:8 twist, which should stabilize all weight bullets. Chambered for 5.56mm, it will of course also handle .223 Remington. The barrel is also low mass, with a diameter of only .5-inch out to the proprietary Viper muzzle brake. Both the barrel and bolt have black nitride finishes. The gas system is mid-length, direct impingement with a low-profile gas block. An AP Custom free-floating carbon-fiber handguard helps keep the weight at the muzzle to a minimum. Numerous slots at the three, six and nine o’clock positions help dissipate heat. The nominal approach continues at the other end of the carbine, with a Mission First Tactical BMS-BATTLELINK™ Minimalist Stock. Mission First developed the stock with heavy input from operators from all spectrums. Their goal was to make a stock that offers all functional requirements while keeping the weight under six ounces. 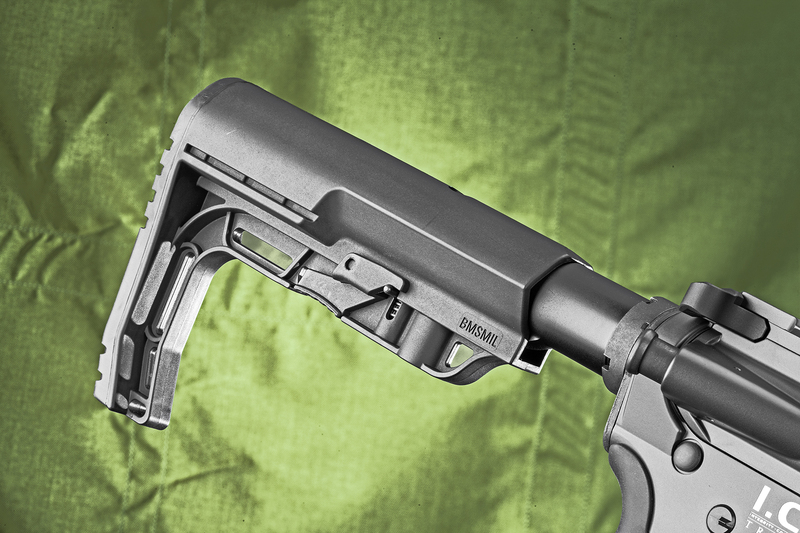 A quick-detach socket-type sling mounting point is on the underside of the stock. “I.C.E. 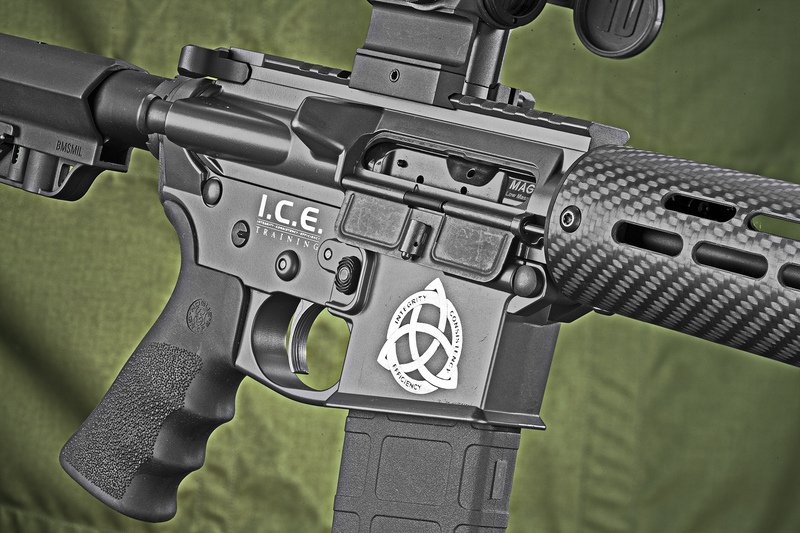 TRAINING” is laser engraved on the right rear of the lower receiver, and the I.C.E. logo is laser engraved on the right side of the magazine well. The AIR 15 includes a custom-fitted padded and lockable hard case and two Magpul 30-round magazines. 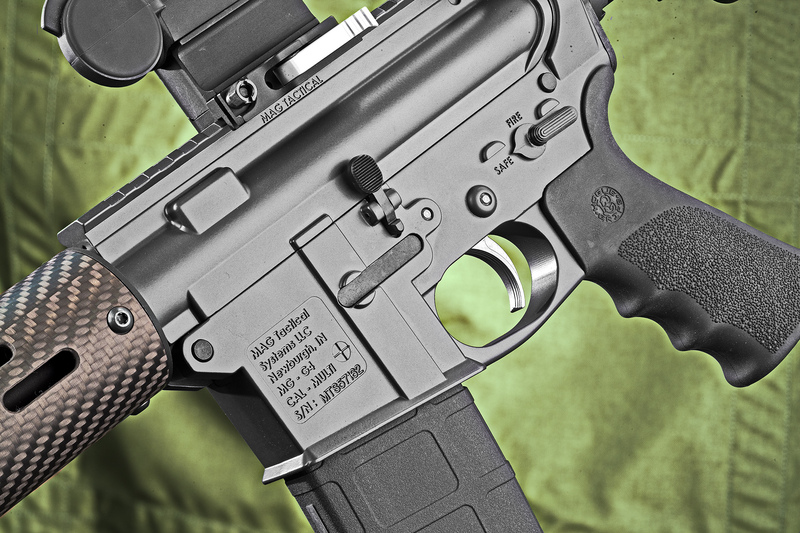 Rifle uses superb Bravo Company Mfg GUNFIGHTER (Mod 4) charging handle. 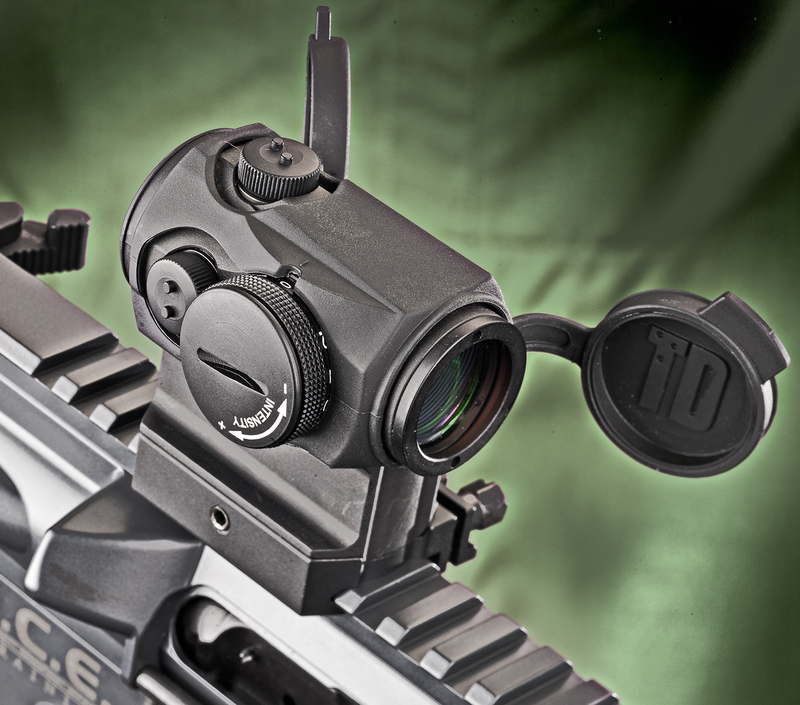 Included with the AIR 15 is an Aimpoint T-1 red dot sight in an Aimpoint LRP throw-lever quick-detach mount. The T-1 has an estimated five-year battery life when the sight is left on at setting eight. The T-1 is the ideal sight for the AIR 15 because it adds only 3.7 ounces—including mount—to the overall weight of the carbine. I have lost or misplaced more than one of the bikini covers that come standard with the Aimpoint T-1, so I replaced the OEM covers with an iO cover from TangoDown. The iO cover gives the T-1 a rubberized armored protection that can’t fall off or get lost. The lens covers nest together when opened. Close-up of right side. Oversized trigger guard is an integral part and not removable. I gathered 19 factory loads and one handload to evaluate the AIR 15. Bullet weights ranged from 50 to 77 grains. I zeroed the T-1 at 50 yards. Many consider this the best distance to zero the carbine because it allows hits within an inch or so from contact to 300 yards. With the bolt locked to the rear, I inserted the first magazine, pressed the bolt release and…the round jammed into the lower portion of the feed ramp. I tried this maybe half a dozen times, switching mags and loads, and the same thing happened. I inserted the first mag/load combo I had tried, pulled back the charging handle, and let go. Presto, the round chambered. My best guess is that the low mass bolt does not always have the momentum to chamber a round by simply pressing the bolt release. I tried both techniques randomly throughout the evaluation. 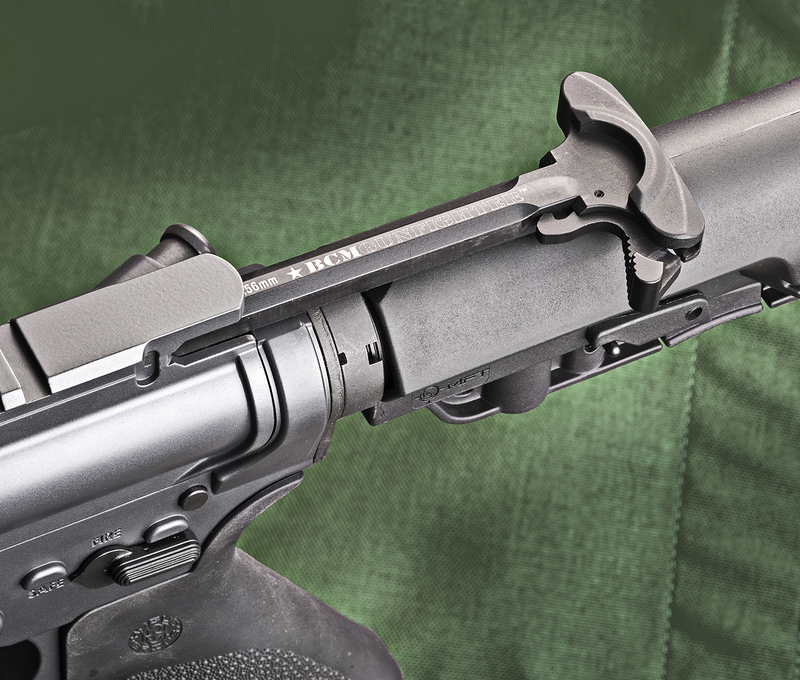 Chambering by pressing the bolt release was hit and miss, but chambering by pulling fully back on the charging handle and releasing it—made easy with the Bravo Company GUNFIGHTER CH—worked without fail. As is my normal practice, I established the velocity for each load using a PACT Professional model chronograph, with the first sky screen ten feet from the muzzle, averaging the results of ten-round strings. Due to the AIR 15’s light weight, I was curious what the recoil impulse would be like. I’m happy to report that the Viper muzzle brake does a great job and—although I’m not recoil sensitive—I could not tell any difference from any other AR. I fired each load for accuracy, averaging the results of two five-round groups from 50 yards prone. The light barrel heats up quickly, and groups often start to string out of a hot barrel. Fortunately, because there is not a lot of surface to remain hot, it also cools down quickly—more quickly than I thought it would. Nonetheless, I locked back the bolt with an empty mag well to allow it to cool between strings. 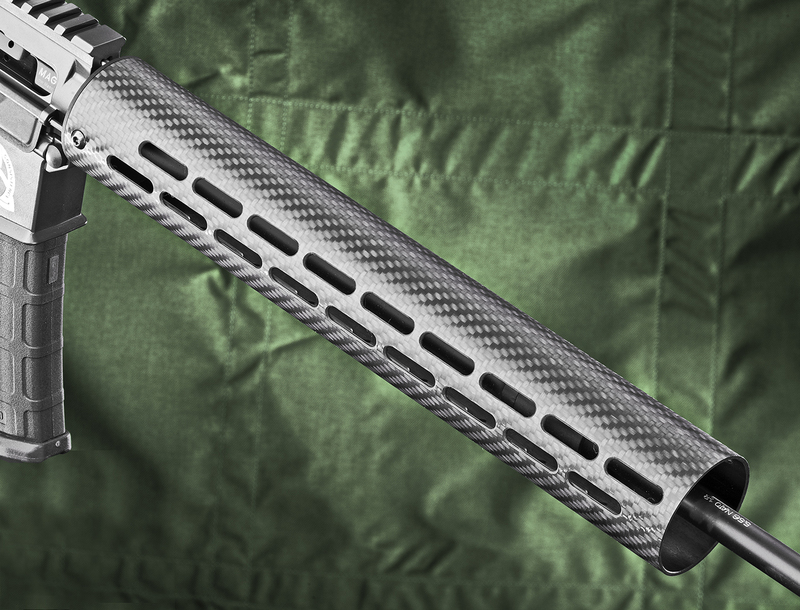 AP Custom free-floating carbon-fiber handguard helps keep weight at muzzle to a minimum. Anyone who has tried several loads through any given firearm—especially shotguns and rifles—knows they seem to prefer one load over another. The AIR 15 liked bullet weights at the extreme ends of the spectrum. 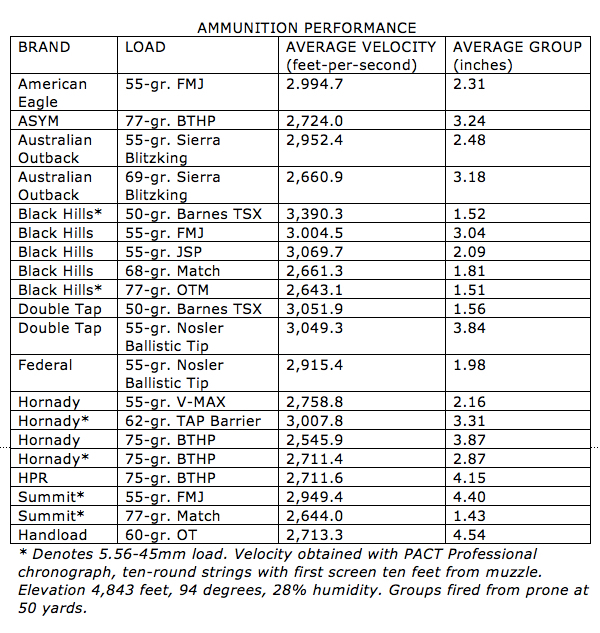 The best group was fired with Summit Ammunition 77-grain Match, with a group of 1.43 inches, followed closely by Black Hills Ammunition 77-grain Match at 1.51 inches. Third place was Black Hills 50-grain Barnes TSX at 1.52 inches, and fourth went to Double Tap’s 50-grain Barnes TSX at 1.56 inches. In the middleweight class, only Black Hills 68-grain Match and Federal 55-grain Nosler Ballistic tip stayed under two inches, at 1.81 and 1.98 inches respectively. I took the two best-performing loads out to 100 yards. Shooting from prone, the Summit 77-grain Match grouped 4.12 inches stringing horizontally. Black Hills 77-grain Match was just under three inches in a tighter group. With a red dot sight this is not too bad, especially considering the very light, thin low mass barrel. Next up came more aggressive, fast-paced shooting drills from almost contact distance to 50 yards. In order to evaluate how the AIR 15 would work with a variety of magazines, I randomly loaded the test ammo into magazines that included USGI, Bravo Company, C Products Defense, Fusil, Lancer Systems, Magpul, SureFire, and TangoDown. The only magazine-related problem came with TangoDown’s ARC mags. They ate all the lighter loads, but I had occasional feeding problems with the longer 77-grain loads. Despite its untraditional look, I began to appreciate the BMS-BATTLELINK Minimalist Stock. The angled end of the stock allows rapid presentation, and the rubberized buttpad keeps it from slipping on your shoulder. The upper section provides a very good cheek weld. TangoDown iO cover gives rubberized armored protection to T-1. You can’t morally or legally shoot what you can’t identify. For that reason, I believe every carbine that is used for defense should have a dedicated weaponlight. 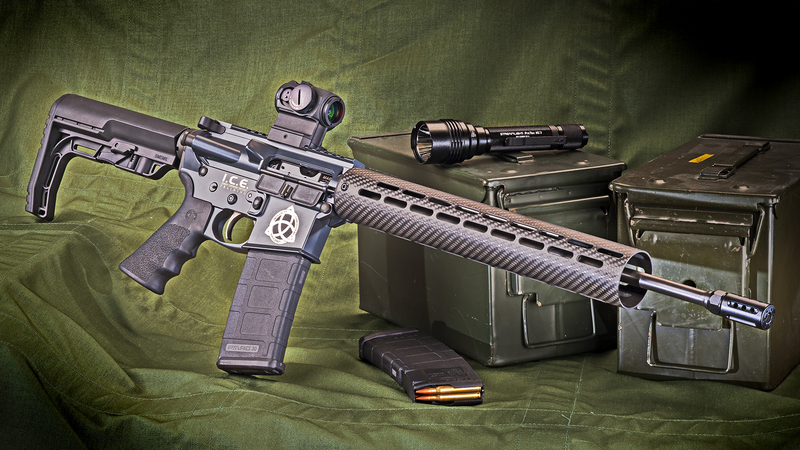 In addition to making carbon-fiber handguards, AP Custom manufactures two- and four-inch rail sections that attach to the slots in the handguard that a light can be attached to. The advantage of having a white light more than makes up for the negligible weight gain with the current crop of weaponlights. 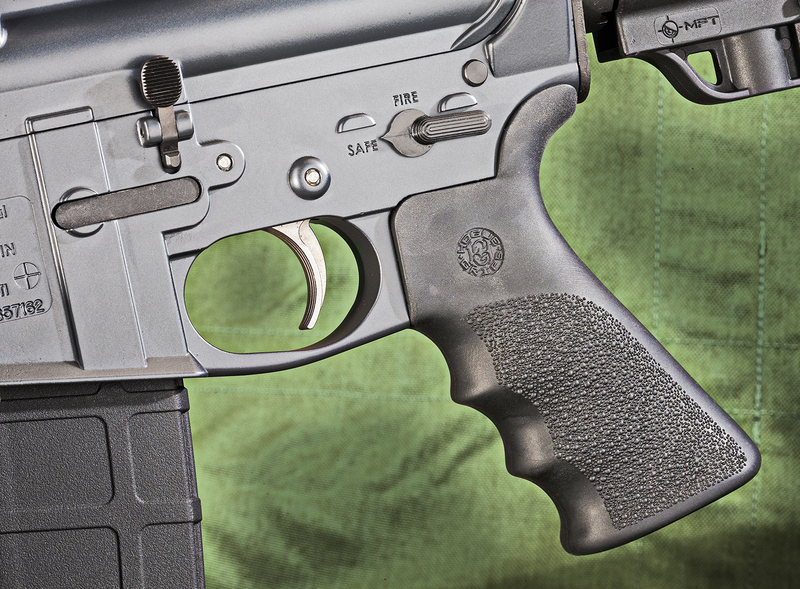 AIR 15 uses Hogue pistol grip and nickel/Teflon finished trigger. I attached one of AP Custom’s short rail sections and—in keeping with the small and light theme of the rifle—mounted an Elzetta Alpha (single CR 123 battery) with standard bezel in an Elzetta ZEX mount and capped it with one of their five-inch tailcaps. The Alpha light produces 315 lumens—plenty to ID a bad guy inside your domicile. 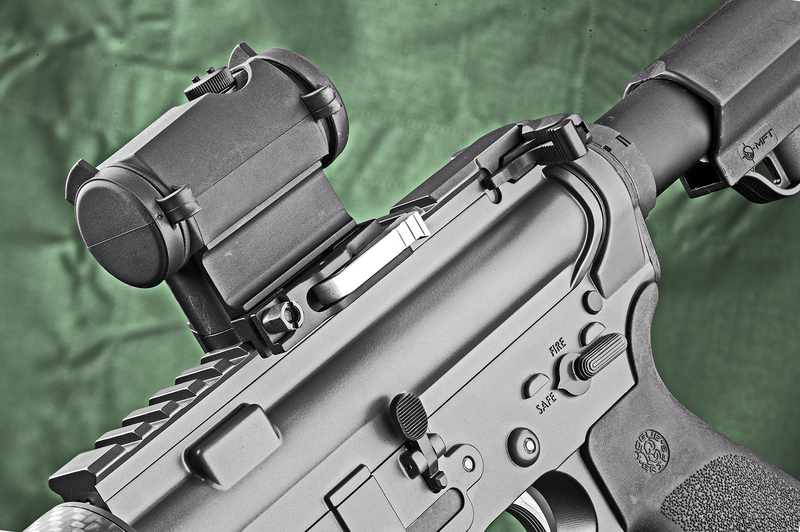 AP Custom also offers a quick-detach sling mount that will attach to the handguard. Even if you choose not to normally equip the AIR 15 with a sling, it’s nice to have the option. BATTLELINK Minimalist Stock has unconventional look but performed well. The AIR 15 is not quite as accurate as some other ARs. Its light barrel is undoubtedly more “whippy” than a heavier barrel. On the other hand, at its worst, it can place rounds into four inches at 50 yards. Which brings up two points: 1) In the vast majority of incidents, a 50-yard shooting—both for private citizens and law enforcement—is almost unheard of. 2) On a two-way range, if you and the bad guy are both moving, and you likely will be, four inches is pretty damn good shooting. In total, I fired a tad over 1,200 rounds through the AIR 15—980 of them in one day. The only problems were the couple mentioned above. Even without the benefit of a sling, I was not nearly as fatigued at the end of the day as I would have been with almost any other AR. And without your arms becoming tired, you can concentrate better on little things like sight alignment, trigger press, and follow-through. At under five pounds with optic and mount, compared to my old bare-bones SP-1 carbine of yesteryear, the AIR 15 is like floating on air. Lightweight and reliable. I like that.